Bangalore is a cosmopolitan city and is also one of the most enterprising and developed cities in India. It was known as the Garden City of India, owing to the sheer number of trees and parks dotting each lane. However, the past twenty years or so have seen a frenzied growth of the city. Bangalore now has earned the name of Silicon Valley of India. And with it came the congestion and pollution issues. Bangalore is a reflection of a perfect blend of old and new. Bangalore enjoys great weather all through the year. It is very well connected to every part of India and also the international locations. Though Kannada is the official language, you can find that almost everyone can speak two other languages in Bangalore. Maddur is a small town in Mandya district of Karnataka. Located at a distance of 82 km from Bangalore, Maddur has an average elevation of 662 metres. It lies on the banks of the river Simsha. Maddur is the tender coconut Capital of India. Close to over 300 trucks of tender coconuts are sent to the states of Goa, Hyderabad, Ahmedabad, Punjab and Maharashtra. Maddur has a neutral weather all through the year. During summers, the weather can hit a peak of 34 degrees Celsius. Winters are not extremely cold. The coldest month is January with the temperature hitting a low of 16 degrees Celsius during the night. By Air: The Kempe Gowda International Airport in Bangalore is the closest airport to Maddur. You will have to take a taxi or a bus from Majestic/Kempe Gowda Bus Terminus to reach Maddur. By Train: There are around 10 trains that ply to Maddur from Bangalore. The time taken to reach Maddur depends on the type of the train chosen. On an average, it takes 2.5 hours to reach Maddur from Bangalore. By Road: There are two routes to get to Maddur from Bangalore. Route 1: Bangalore - Ramnagara - Channapatna - Maddur, via Mysore Road & NH 275. This takes around 2 hours to reach and covers a distance of 82 km. Route 2: Bangalore - Kunigal - Huliyurdurga - Tubinakere - Maddur, via NH 75 and Kunigal-Maddur road. This covers a distance of 123 km and takes 2 h 39 min to reach. Route 1 is shorter than route 2 and also has better roads, therefore travelling on route 1 is recommended. Here are the places you can visit upon taking the route 1 for your travel from Bangalore to Maddur. You could start Bangalore early in the morning to avoid being stuck in the traffic. 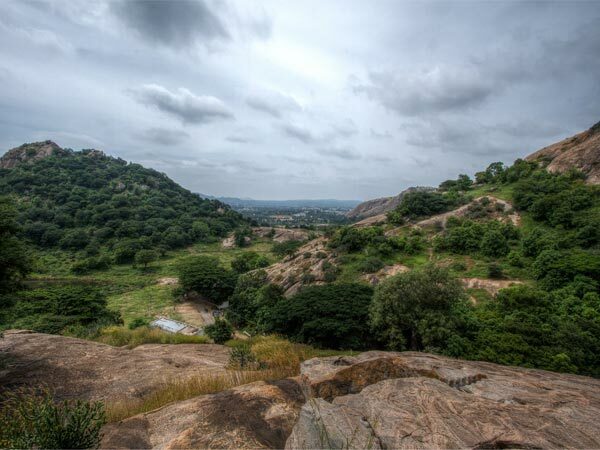 You would first reach Ramanagara, which is at a distance of 55 km from Bangalore. This takes about 1 h 25 min to reach. Ramanagara is famous for appearing in the famous Bollywood movie ‘Sholay'. Atop the Ramadevara Betta was where Gabbar Singh's house was stationed. You can hike up the betta (hill) and offer prayers to the God in the temple which is at the top of the hill. Channapatna is next, which is just 30 minutes away from Ramanagara. It is about 15 km away. Channapatna is well known for its wooden toys. The streets of Channapatna are full of colourful wooden toys. It is known as the Gombegala Nagara (town of toys). The art of making wooden toys was encouraged by Tipu Sultan and he invited Persians to come down to India to teach the local artisans. The toys are made of ivory wood and vegetable dyes, which are completely safe to use for teething babies. Channapatna toys are not always dolls and toys, they also have mathematical puzzles and games. Varadaraja Temple in Channapatna is a beautiful temple that depicts the architecture of the Vijaynagar empire. Maddur is 21 km from Channapatna. It takes about 30 minutes to reach the place from Channapatna. Maddur is famous for the Maddur Vade which is immensely popular here. This delicious, brittle, yet soft savoury fritter snack was initially sold on the trains alighting at Maddur. However, due to the rising demand of this scrumptious snack, it is now sold all over Maddur. It is made of rice flour, semolina, all purpose flour, onion, curry leaves, coconut and asafoetida. The ingredients are mixed, flattened and then deep fried. Maddur is also a favoured destination for leisurely long drives and biking among the younger crowd of Bangalore. Arrive at anytime and chill-out with friends and family at the 247 coffee shop. There isn't much in this tiny town itself, but here are some places to visit around Maddur. This temple dedicated to Cheluvanarayana, also known as Tirunarayana, is a form of Lord Vishnu. It is located at Melkote, which is around 50 km from Maddur. The temple has enjoyed special privileges from the Mysore Maharajas. There are three crowns - Rajamudi, Krishnarajamudi and Vairamudi - offered to the temple by the Rajas of Mysore. Vairamudi is an annual festival which sees a crowd of more than 4 lakh people. This temple around 56 km from Maddur and it takes an hour and a quarter to reach from Maddur. This is another important temple in the area which is dedicated to Lord Vishnu. According to art historians, the mulaprasada is shaped like a star, which is a thought much ahead of its times. These are created by the river Cauvery and run down a gorge of 75 metres. Together, they are known as Shivanasamudra Falls. They are about 52 km from Maddur. These two spectacular waterfalls are considered to be among the best 100 waterfalls in the entire world. This was the erstwhile summer palace of Tipu Sultan. It has a splendid architectural style and boasts of some of the amazing art pieces from his era. It has a big lawn that is perfect for picnics. However, photography is banned inside the palace premises. Located in Mandya district, Bheemeshwari camp is heaven for nature and adventure lovers. Some of the adventure activities available here are kayaking, rafting, ziplining, rope walking, etc. These forests have a great wildlife, replete with animals, reptiles and about 200 species of birds. Kokkrebellur Bird Sanctuary is a paradise for bird watchers. It is best to visit this place between December and March, as it is the nesting period for birds. There are more than 500 species of native and migratory birds that live here.